Driving at up to 300mph, as Top Gear presenter Richard Hammond was when he crashed, is more like piloting a jet fighter than handling a car, says Andy Green, holder of the world land speed record. 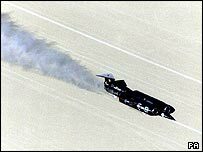 Exactly a month ago today, Wing Commander Andy Green was flinging himself across the Bonneville salt flats in Utah, USA, at speeds more typically associated with flying than driving. Strapped, as he says, "between two enormous diesel engines which are directly bolted to the chassis which I'm also strapped to," he touched 328mph - breaking the existing diesel land speed record by almost 100mph. The following day he set a further record speed of 350mph. "The vibration was quite high. The noise was enormous. There was an enormous amount of heat in Bonneville and there's a fair bit of diesel smoke kicking around in the cockpit. It's definitely not a holiday environment," recalls the RAF pilot. 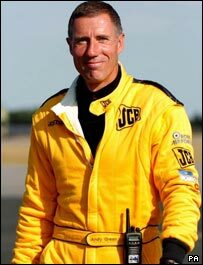 Andy Green: "It would be a dull world without record breaking"
For Wing Cdr Green and the UK-led team behind the record breaking JCB Dieselmax car, it was all they'd set out to achieve. But while news of the triumph made the papers back home, it didn't perhaps earn the column inches one might expect for this remarkable combination of British engineering and derring-do. Maybe it was because Green had already claimed an even more revered crown - that of the fastest man on Earth. In 1997, the RAF pilot clocked 766mph in a jet-powered car, breaking the sound barrier and the world record. The severe injuries suffered by Top Gear presenter Richard Hammond have highlighted the risks of driving at such high speeds. While an investigation is under way into the cause of Hammond's accident, Michael Harvey, editor of Top Gear magazine, commented to the Daily Telegraph that "clearly at those kinds of speeds the tiniest little thing has to go wrong and the speed obviously massively exaggerates the consequences". But what's it like to drive a car at such perilous speeds and how does a driver keep control? Many people will be familiar with the rituals of Formula One motor racing, even if they haven't been in the driving seat of a F1 car. While there are similarities, says Green, there are also stark differences. "Both drivers need to recognise when they can push harder, when they are somewhere near the performance limit and when they've exceeded the limit. And then knowing what to do about it and putting in appropriately quick but smooth actions to sort that out," says Green. But while Formula One drivers get to test their cars over thousands of laps, identifying niggles and helping improve performance, there just isn't the time or money with extreme performance cars such as ThrustSSC, which Green drove in 1997, or Dieselmax - the car that earned him a second mention in the record books last month. "You have very little time and very few runs in which to learn about the car. Each run takes a long time to set up, weather windows are limited and the budget is limited because you are away from home." The overseas element, says Green, is down to the fact that the deserts of Utah, or Nevada where he broke the record in 1997, offer miles and miles of flat, open space - perfect for "straight-line driving". But just keeping a car straight at such bewildering speeds is a skill in itself. Green mentally returns to the cockpit of Dieselmax and recounts in detail the process of taking the car from a standing start to 300mph plus and back to zero in about three minutes. Just listening to the minutiae of intense mental processes and physical pressures is exhausting; one can only imagine what it's like to be in his shoes. "Warming the engines up and dropping it into first gear - that's all reasonably easy. Getting the car on boost requires accelerating to 1,800rpm in first - about 60mph; then starting very gently to left-foot brake while keeping the power on to force the engines to work harder," says Green. "So I'm now looking at the exhaust temperatures compensating for the fact that one of the thermocouples was a bit erratic, so I multiply the reading by about a third to get the real exhaust temperatures, looking for about 400 degrees on both that would then start to indicate boost on engines." All that has happened within the first 10 seconds. It's no coincidence that Green's day job is piloting jet fighters for the RAF. "I could give you the exact same description just doing a take off in a fast jet never mind air-to-air combat or low-level flying." But while aircraft were made to fly at such breakneck speeds, taking a car to such speeds just seems unnatural. Even the technology on Dieselmax seemed to concur. The on-board GPS tended to conk out at 223mph because of a "software error". GPS? Was Green worried about getting lost in the desert? It was needed to calculate his speed since a normal speedometer would be corrupted by the fact the car wheels grew by 10% in the course of a run. Eventually, Green ended up calculating his speed from the rev-counter. Clearly driving at 300mph has about as much in common with belting down the motorway, as piloting a Stealth fighter has to flying a kite. Throughout the brief run, Green has to maintain an intense concentration and alertness. By the time Green begins to apply the brakes - slowing by 20mph-per-second - he is several miles from the start point. "The wind is entirely different at one end from the other. The run is 11 miles. That's the distance from the outskirts of London to the centre and I'm driving that in two minutes and the cross wind is changing and I can feel it changing and monitoring that all the time." So what does driving at that speed feel like? "The obvious thing is the ground goes past very quickly. But you can control the car and make decisions incredibly quickly. If you're fearful you probably shouldn't be driving like this - why are you doing it." But if Green considers his fighter pilot training crucial to the task, what does he make of Top Gear presenter Richard Hammond taking on something similar? "It's a very brave thing, especially for a non-specialist. Richard's got an enormous array of driving skills but great credit to him for actually getting involved in a niche sport like this; trying to do something which is inherently difficult." Thank goodness there are still men out there that we emasculated western men can look up to. There will be any amount of ninnys both male and female will condemn this, but at least he took a risk and paid the consequence. We need more spirited men and women who are prepared to take a risk for role models for our over risk adverse government. My sympathies with richard hammond and his family. I hope this does not stop Top Gear from providing entertaining shows. All we need is for the fluffy do-gooders to show their typical knee jerk reactions. The views of people that drive at 30 in beige Volvos do not reflect the views everybody so stop trying to inflict them on us. A waste of time really. There is nothing brave about putting your life at risk - just stupidity and the need to satisfy ego. Andy Green is a real superman hero....only faster. What fantastic BRITISH achievements. There is a group of people that get into cars like this regularly and head for 300 mph. Some are veterans of over 20 years with many hundreds of such runs to their name. Top Fuel and Top Methanol drag racers are doing 300mph plus and 260mph plus regularly - and they reach those speeds in 4 and 5 seconds from a standing start, not over the course of a minute or so. We have had some spectacular high-speed crashes in our sport too. The car that Richard was in when he crashed was built in the 1970s and (unless it has been updated - I don't know because I haven't seen it for some years) the roll cage wouldn't be considered good enough to race now. 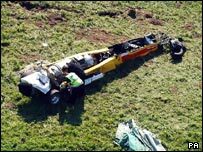 A few years ago we had 2 crashes at that kind of speed and both drivers walked away because of the safety built into their modern chassis and the personal safety equipment. I'm not denigrating the standards of the car owners (who I must say I do know in passing from many years of involvement in British Drag Racing) in any way. I'm sure they did everything they should and could have done. I'm just trying to say that you don't have to be a 'Top Gun' to do attempt this (I know, I trained as an RAF pilot too). Some drive concrete lorries, some build racing cars or custom bikes for a living, one is a travel agent and others fit kitchens, work in IT, etc. Their livelihoods and profiles may not be as glamorous but they have just as much ability, skill, bravery and determination as Andy and Richard. In fact I'd rate them higher in terms of achievement because they have to put in a huge amount of effort and personal time to fund their passion and fit the work involved around a full-time job before they can even get in their cars. I wish Richard a full recovery, to a certain extent I know how it feels. I was part of the team that set the British LSR way back in 1977, at Elvington, using a peroxide powered rocket car named The Blonde Bombshell. The first BBS also came to grief on a infamous "strip of land", Pendine Sands in Wales. Alas, the second car we built came to a similar end, due to money issues compromising safety, but it was a good feeling when the project did have a limited success. I think I'll stick to my Skoda. I hope he fully recovers his health although I should imagine this experience will leave some scars. The Top Gear team remind me of a bunch of 6th formers who entertain and are admired by their simpering mates at someone elses expense. But guess what - they muck about with some fireworks and one of them gets hurt. I hope no more of my license fee is used for thier own personal amusement. I really feel sorry for his family, especially his kids - tough break for them. Both Richard Hammond and Andy Green have my utmost respect for doing this... it requires serious courage to attempt such a stunt. However this article highlights exactly how phenomenally difficult driving at such speeds are.. hopefully no other journalist will try and replicate it. If driving rocket cars manually to their limit is extremely dangerous and consequences are unpredictable, why not test the vehicles to their limits using automatic systems/computers before attempting to drive manually? Some faults are only found when the machines reach max speeds! Well its all good. Isn't the whole point of reality TV that some wealthy producers get a bit wealthier through the enormous voyeuristic tendancies of the viewing public, especially at other people's destruction, humiliation or indeed injury??? We can all rest assured now that the Producers will enjoy the benefit of increased viewing figures for the next series of Top Gear catalysed by the horrific accident of Richard Hammond. God Bless the Producers. Andy Green sums it up all very well right at the end when he states that Richard Hammond's not a specialist. I'm a huge fan of Top Gear - love it all, but as some have said maybe this was a step too far.